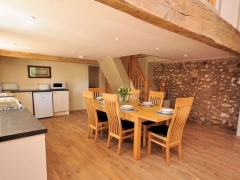 A peaceful holiday retreat to relax and unwind in whilst also being a great base from which to explore. 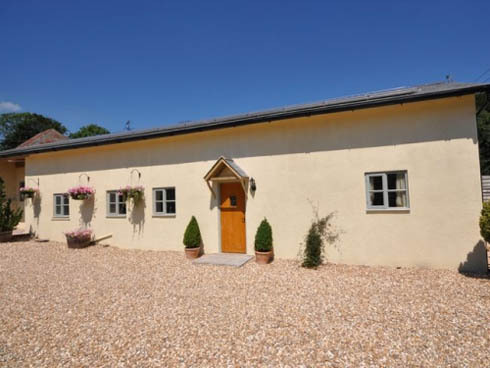 This delightful, recently completed, barn conversion occupies a hillside setting in the owners' grounds surrounded by beautiful countryside with many footpaths and is situated 1.5 miles from the village of Sidbury. 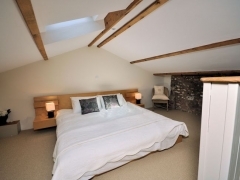 This charming property with oak beams has been finished to the highest of standards and offers ONE bedroom: large room on a mezzanine floor with reduced height ceiling and contains 1 super king-size and 2 single beds, which are reached by a steep staircase. Shower room: wet room on the ground floor with WC. 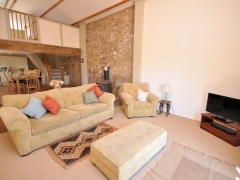 Lounge/kitchen/diner: open-plan, large lounge area with double height ceiling, flatscreen TV with Freeview and woodburner (logs included). Kitchen/diner with gas oven and hob, fridge/freezer, microwave and dishwasher. Utility room: external with washing machine. Outside: large patio door from lounge area leads to elevated decked area with stunning views over the valley below, seating and brick BBQ. Steps from decking lead down to enclosed lawn area. Amenities: parking for 2 cars (maximum) immediately outside the property. Bed linen, towels, electric and wi-fi included. Smoking is permitted outside only. 2 well-behaved dogs welcome but please bring your own towels to dry muddy paws. Location: beach 5 miles, shop and pub 1.5 miles. 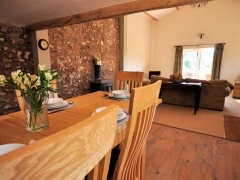 Contact: Mr. Roger Davey, Higher Sweetcombe, Sidbury, Sidmouth, Devon EX10 0QR.